Sciblogs | How much water do we use? As it turns out, about 80% of the water that falls on New Zealand flows out to sea, the rest evaporates back into the atmosphere. As for what we use, Lachlan McKenzie, previously from Federated Farmers, is cited as saying that 97% of New Zealand’s water flows wastefully to the sea (audio). Similarly, in a Q&A file released in May, the Government states that 2% of our freshwater resource is used. According to the Aqualinc report, nearly 27,000 x 106 m3 of water may be abstracted from rivers and aquifers each year. That’s almost half the volume of Lake Taupo*. Of this, 16,000 x 106 m3 is for the Manapouri hydropower scheme that takes water from the Waiau River and discharges it directly to the sea. If we’re just thinking about water that can be consumed for irrigation, drinking and so on, then we’re left with 11,000 x 106 m3. 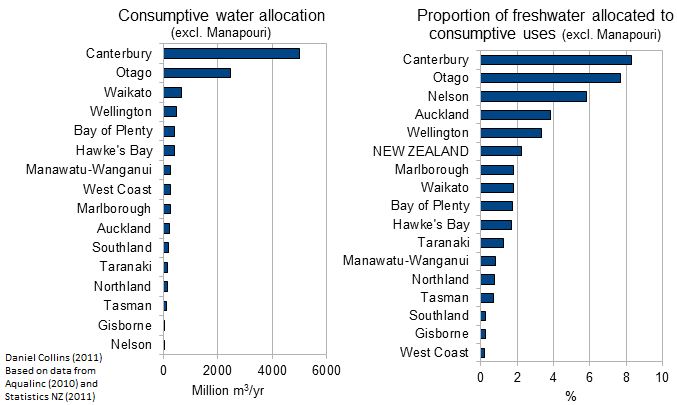 Using the Statistics NZ data (either 2006 or 2011 reports), this is 2% of New Zealand’s annual freshwater supply. For a more useful description of the annual water used in each region, check out the figures below. Omitting Southland’s hydropower, most of the water allocated for consumptive purposes is in Canterbury, followed by Otago. Canterbury’s allocation is 5,000 x 106 m3/yr — nearly half of New Zealand’s total. As a fraction of each region’s annual water supply, Canterbury and Otago are also on top, at 8.3% and 7.7% respectively. Cool and wet Southland and West Coast come in at the bottom with 0.2% each, as does less developed Gisborne. It’s easy to see how the regional picture is a lot different from the national picture, but in terms of how we use our water, this is really only part of the jigsaw puzzle. Stay tuned for more pieces. * The volume of Lake Taupo is about 59 km3 or 59,000 x 106 m3. 27,000 x 106 m3/yr is about 21 Olympic swimming pools worth of water per minute. Hi Daniel – Good to see you’ve had a go at breaking down the stats to give a more meaningful picture – but unfortunately regional picture is about as relevant as national one! Need to go to a catchment basis to give something of relevance. You also need to be aware allocation comaprisons between regions are meaningless in NZ as every region allocates water differently (rates, annual/monthly/fortnightly/weekly volumes, and then reliability factor and technical efficiency % if any………….). There are even inconsistencies within regions. Finally the allocation picture is very much a meaningless measure as it’s the actual use that counts…… and we’ll start getting a good handle on that by 2016……. Always happy to talk if you’ve questions.